A team from the UN's nuclear watchdog has inspected a previously secret uranium enrichment plant in Iran, Iranian officials and media have said. The inspectors from the International Atomic Energy Agency are expected to visit the facility, near the holy city of Qom, again over the next two days. The visit comes as world powers await Iran's response to a new proposed deal over its uranium enrichment programme. Iran would send some enriched uranium to Russia to be turned into fuel. The proposed deal is seen as a way for Tehran to get the fuel it needs for an existing reactor, while giving guarantees to the West that its enriched uranium will not be used for nuclear weapons. But opposition inside Iran to the agreement is said to be growing. The government has promised a response this week. 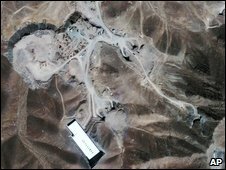 Sunday's inspection by the four-member IAEA team was the first time the agency had been allowed access to Iran's Fordo enrichment facility, which is being built about 30km (20 miles) north of Qom. During their three-day mission, the inspectors are expected to compare the engineering blueprints submitted by Iran with the actual layout of the plant, interview employees, and take environmental samples to check for the presence of nuclear materials. They are not expected to report until they leave Iran, but some Iranian officials have already said the inspection shows their country's nuclear activities were both transparent and peaceful. The Iranian government says the Fordo plant - which is cut into a mountainside, constructed of reinforced concrete and protected by military installations including missile silos and anti-aircraft batteries - will not be operational for another 18 months. They claim it will be large enough to house 3,000 centrifuges, which will produce uranium that is 5% enriched, suitable only for peaceful purposes. Weapons-grade material is more than 90% enriched. Iran agreed to open the site to monitoring at talks with the five permanent members of the UN Security Council plus Germany in Geneva on 1 October. BBC Tehran correspondent Jon Leyne says the Iranian government announced the existence of the Fordo plant last month, apparently because Western intelligence agencies had already discovered it. But having had weeks before the first inspection, the Iranians would have had plenty of opportunity to remove anything there that might have been incriminating, our correspondent says. On Saturday, the White House said Barack Obama had telephoned French President Nicolas Sarkozy and Russian President Dmitry Medvedev to thank them for their countries' roles in developing the latest plan on Iran's enriched uranium. Under the deal, most of Iran's low-enriched uranium would be exported to the IAEA and sent to Russia for further enrichment and on to France for refinement. Iran would get the fuel it needs for a research reactor in Tehran that makes medical isotopes, but this would not be sufficiently enriched to make a nuclear weapon. It has said it will respond to the offer by the middle of next week. Iran says its nuclear programme is for purely peaceful purposes but the revelation of the existence of the new plant near Qom had increased fears in the West about Tehran's intentions.